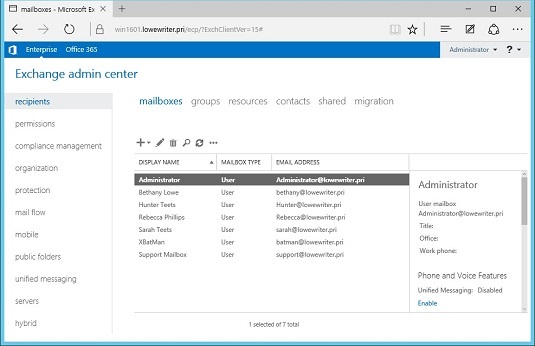 Open the Exchange Admin Center by choosing Start → All Apps → Microsoft Exchange Server 2016 → Exchange Admin Center. When prompted, enter your username and password. The Exchange Admin Center comes to life. Click the plus sign (+) icon above the list of mailboxes, and then choose User Mailbox. 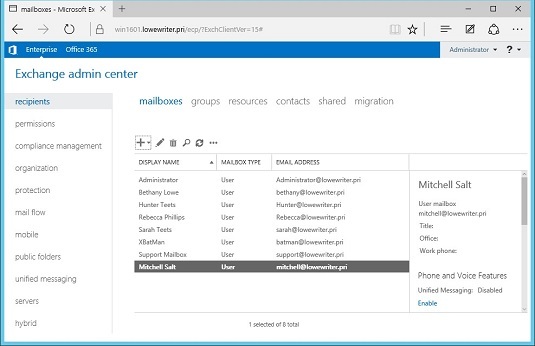 The New User Mailbox page appears. Enter the alias for the new mailbox. The alias is the portion of the email address that appears before the at (@) sign. For example, in the email address mitchell@lowewriter.com, the alias is mitchell. Type the user’s first name, middle initial, and last name. As you type the name, the Display Name field is automatically filled in. Change the Display Name field if you want it to appear different from what was proposed. For example, you may want to reverse the first and last names so the last name appears first. Enter the user logon name. This name must be unique within the domain and will be used to form the user’s email address. Enter the password twice. You’re asked to type the password twice, so type it correctly. If you don’t type it identically in both boxes, you’re asked to correct your mistake. If the password is temporary, select the User Must Change Password at Next Logon check box. This setting requires the user to change the temporary password the first time he or she logs on. Click Save. 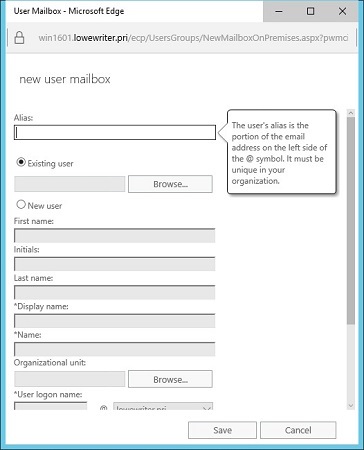 The user’s mailbox is created and appears on the Recipients page. The new user’s mailbox appears on the Recipients page. Pat yourself on the back; then click Finish. You’re done!